Jerry Mock, center, had severe acid reflux to the point that he had stopped eating evening meals altogether. 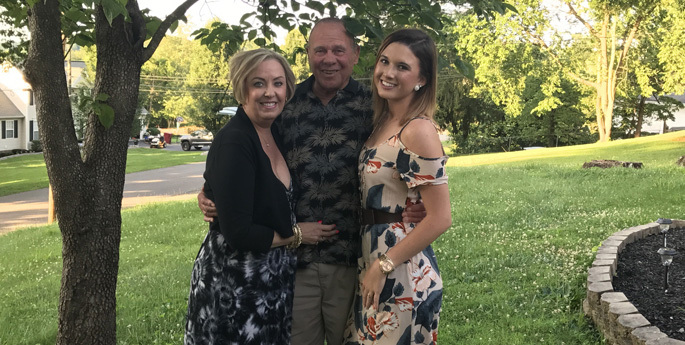 Now, after minimally invasive surgery at Vanderbilt University Medical Center, he enjoys dinners with his family again, including wife Susan and granddaughter Hannah Mock. For three years, 79-year-old Jerry Mock didn’t fully enjoy family vacations or gatherings with friends because his gastro-esophageal reflux disease (GERD) was so debilitating that eating even a bite of food after 1 p.m. guaranteed he’d have intense burning pain in his throat and chest that night. Now, instead of saving dinners in the refrigerator to heat up for breakfast, Mock is looking forward to seafood feasts in Florida during his Christmas vacation. He credits Chetan Aher, MD, assistant professor of Surgery, for performing the laparoscopic surgery six months ago that resolved his problem. Mock was referred to see Aher at Vanderbilt University Medical Center (VUMC), a 300-mile drive from his hometown of Elizabethton, Tennessee, a journey he didn’t mind if it meant living normally again. Aher recommended minimally invasive surgery to address his GERD. Mock had developed a large hiatal hernia, and much of his stomach had actually moved up into his chest through the opening in his weakened diaphragm, the muscle separating the abdomen from the chest. Twenty to 30 percent of the U.S. population experiences chronic acid reflux or GERD. For many, the treatment includes dietary and lifestyle changes, as well as taking antacids or proton pump inhibitor (PPI) medications such as Prilosec and Nexium. PPI drugs reduce the amount of acid in the stomach, making reflux less painful, but they don’t prevent it from happening. In addition to discomfort, acid reflux can damage the esophageal lining, which can lead to swallowing problems and an increased risk of esophageal cancer. To better serve patients like Mock who either don’t get long-term relief with medication or who would like an option aside from taking medicine forever, Aher is leading the establishment of a comprehensive surgical program at VUMC for the management of heartburn. An evaluation to diagnose the severity of the acid reflux might include an endoscopic exam, fluoroscopic imaging or an esophageal manometry test that assesses the function of the esophagus. A pH test can also be performed to measure the amount of acid that flows into the esophagus from the stomach. A standard surgery for GERD is a fundoplication, where the upper part of the stomach is wrapped around the outside of the lower esophagus to strengthen the sphincter muscle, and at VUMC, this is typically a minimally invasive laparoscopic procedure. In early 2018, VUMC will also offer LINX surgery, a laparoscopic procedure to place a small ring of titanium-covered magnetic beads at the base of the esophagus to reinforce the sphincter muscle. The ring expands when food or liquid travel down the esophagus, then the magnets pull back together to prevent stomach acid from going up the esophagus. While the procedure will likely resolve the problem for most individuals, some might need to continue to take a reduced amount of medication, Aher said. VUMC offers a Heller myotomy, a laparoscopic surgery to correct an esophageal disorder known as achalasia that makes swallowing difficult. A new procedure for achalasia that requires no incisions at all called peroral endoscopic myotomy or POEM will be offered at VUMC early next year. The procedure is performed entirely by inserting an endoscope through the mouth. VUMC also offers the Stretta endoscopic procedure to treat GERD that delivers radiofrequency energy to the lower esophageal sphincter (LES) and part of the stomach. The energy heats the tissue, causing it to swell and bulk up the junction between the stomach and the esophagus. As for Mock, he’s back to dining out with friends and family, cooking meals at home and he and his wife are looking forward to taking another cruise, something they loved doing before acid reflux interfered.